Claire has grown up so much in the past month, it’s crazy! She’s talking so much more and we can totally tell she’s listening and taking in what we’re saying. We absolutely love seeing more of her personality come out and have been having so much fun with her! Weight: I have no idea but we just recently started putting her in 12-18 month clothing. Some brands are already super snug while others are a bit big but they are much more comfortable for her. To grab our hand and lead us to where she wants to go. To hold our hands and walk around. To say “ow” when she’s not getting what she wants. Not funny at all to us. But she clearly knows that it’s a way to get what she wants. Winnie the Pooh, Mickey Mouse, Lilo & Stitch, Frozen. You know, the usual for her. Pools and oceans. She loves anything water-related! To pretend to drive the car. She has to do it every time we get into the car which means that we need to get ready to go somewhere much earlier to account for extra “driving” time. Parks. She loves to go down the slides, climb on the play structures, go in the swings, and meeting new little friends. To copy and repeat what we say and do. To share! Really, she absolutely loves sharing her food and toys with anyone. Buses, trucks, and birds. If she sees any of them, she yells out in excitement and wants to chase after them. Papa (my dad). It has been a recurring theme but he’s still her most favorite person in the world. To play in one of the kitchen cabinets that has all her sippy cups. She likes to take them out, stack them, and reorganize the shelves. She knows that’s her one cabinet that she has free reign over. She has a little cupcake purse that she likes to put toys in and wear around the house. She even likes putting her water bottle in it. Too cute! Carseats. UGH. It has been much harder to run errands this month because every time we get into the car, she needs to pretend to “drive” the car and then when we finally try to put her in the carseat, she fights it. She absolutely loves to scream “OW” at the top of her lungs when we’re trying to do it, even though we are not hurting her, which in turn makes all people that pass us in the parking lot stare. It’s no fun. Diaper changes. Another wrestling match for us around 95% of the time. Socks. She always rips them off. Talking! She’s saying more words and we love being able to understand what she wants. She finally says “Mama” now when she wants me. Makes me soooo happy! She’s been saying “Dada” for forever but CJ has now graduated to “Daddy”. Also the cutest thing in the world. Generally, she sleeps from 8pm to 5:30am. I really wish she would sleep in a bit more! She’s still taking two naps a day but once in a while if we’re running errands in the morning and get back a little later, she’ll take one nap that day. She’s still nursing. For the last month, it’s still been twice a day with the exception of the last two days, it’s only been before bed. I’m making much less milk. She’s loving daycare now! We came back from vacation this week and I would have bet money that she would fight us dropping her off at daycare but she was perfectly happy when we brought her there. In fact, one morning I put her down and she walked up to the owner of the daycare and gave her a hug! It was the sweetest thing in the world. We are incredibly happy we made the choice to bring her to daycare. She’s so social! When she sees other little kids, she always waves and says hi. She’s always trying to make new friends. 🙂 We went to the park last weekend and she said hi to all the kids. She even watched what they were doing and tried to copy them (including trying to climb UP the slide when she saw an older little girl do it). 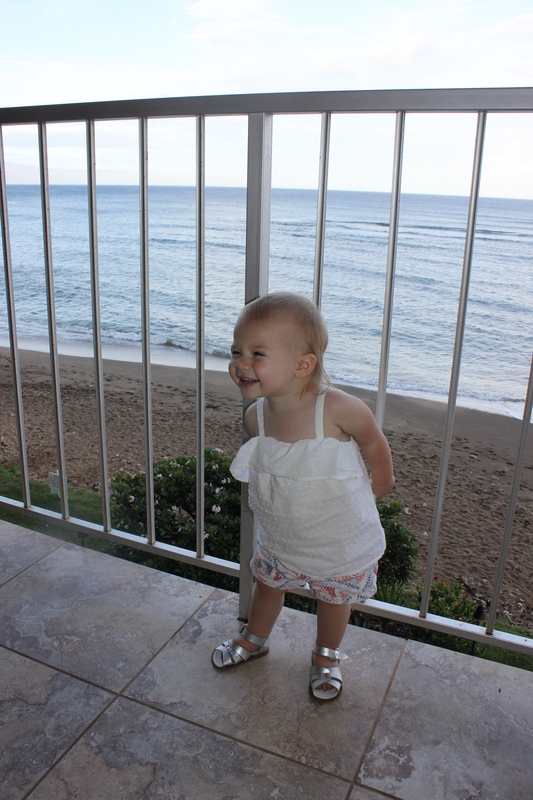 She also loves babies, we saw one at the luau on our vacation and she walked right up to her and said “hiiiii”. TOO CUTE! She doesn’t like her food to be mixed or to be touching each other. Generally, she prefers one type of food to be served at a time or for it to be put in one of those plates that has sections. Such a silly little girl. When she takes a big sip of water, she makes an “ahhh” noise after swallowing. So adorable! She is definitely a mini-me. For example, when she gets walking really fast, she swings only one arm. I still do that. She also likes to collect sticks in our front yard. I used to do that when I was camping when I was little (to help with the fire, of course!). She furrows her brows a lot when she’s confused, focused, when people are making funny faces at her, or generally when she feels like it. My sister said that I used to do that all the time when I was a baby. She ALWAYS is working on some sort of project. My mom said I was like that too – so determined and focused on completing whatever task I was doing. Sometimes CJ and I will be talking about something funny in a conversation so, naturally, we’ll laugh. 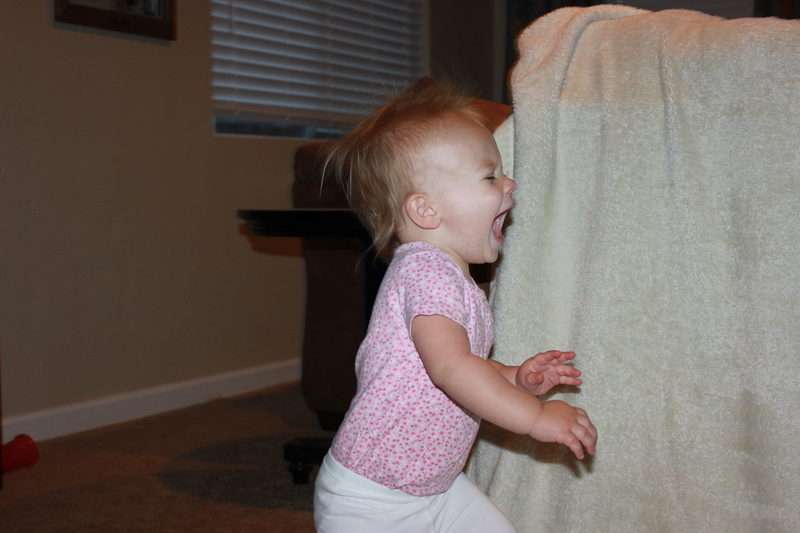 All of a sudden we hear Claire laughing and we realize, oh she’s totally paying attention and mimicking what we do! We love it. I take a million videos of her a day because I can’t handle how adorable her voice is. I just want to pause time and have her be this age forever. She’s so fun, curious, and adventurous right now! We can’t wait to see what changes in another month! 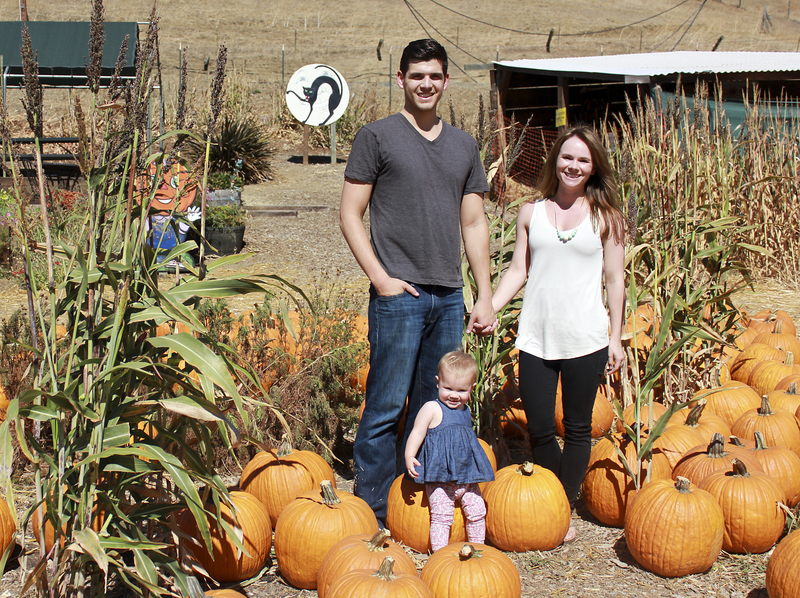 Our trip to the pumpkin patch was a little too hot for our liking. Where is the fall weather?! ?